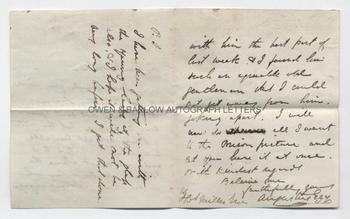 AUGUSTUS EGG Autograph letter Signed. British (English) painter. A member of The Clique group of artists. ALS. 3pp. Kensington. 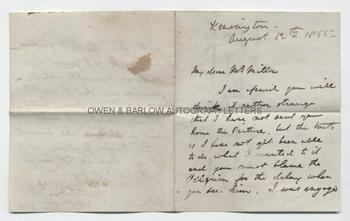 August 12th 1855. To Tho[ma]s Miller. 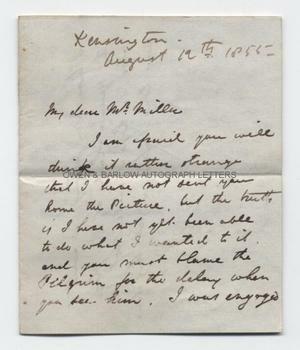 "I am afraid you will think it rather strange that I have not sent your home the Picture, but the truth is I have not yet been able to do what I wanted to it, and you must blame the Belgian for the delay when you see him. I was engaged with him the best part of last week and I found him such an agreeable old gentleman that I could not get away from him. Joking apart, I will now do all I want to the [Reunion?] picture and let you have it at once. With kindest regards, Believe me, faithfully yours, Augustus Egg. P.S. I have been getting on with the young lady at the glass also, and I hope it will not be very long before I get that done." 16mo bifolium. Approx 5.5 x 3.75 inches. Slight mounting traces to verso of last leaf, else near fine. Augustus Egg was an influential and much admired artist and a member of The Clique group that included Richard Dadd. Unlike other members of the Clique, he was an admirer of the Pre-Raphaelite style and was an early encourager of the young Holman Hunt. The most famous work by Augustus Egg is probably the triptych, Past and Present, depicting the decline of an adulterous woman and her family. Thomas Miller was a prosperous Lancastrian collector who commissioned works from many important artists of the 19th century. Provenance: From the 19th century album of Emma Marshall of Penwortham Lodge, Preston. Emma was the daughter of William Marshall, land owner and cotton manufacturer, and was related by marriage to the Miller family of baronets, M.P.s and land owners, one of whom was Thomas Miller, to whom Augustus Egg is here writing.